Missing NZ already. As soon as I got to San Francisco I realized some of the things I will be missing from the Southern Hemi. Pies, world news, hidden tax, no tipping, chilled attitude, fit people, not using ketchup (which I use because it’s free in Canada, bad for you! ), so much more that I can’t think of right now. I just have to figure out how to deal with the high cost of living, distance to get to Canada and rain. Best news is that you can now fly direct to Auckland from Vancouver! No more US customs!! And if they are going to make you take off your shoes, why don’t they provide chairs!!! Oh and to all my friends from outside of North America, my eyes and fingers are virgin to finger prints and retinal scans!!!! 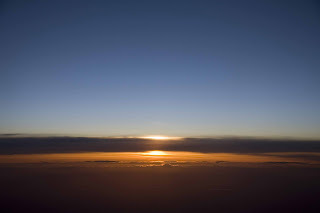 Photo from 36,000 feet above the earth! What are you going to do back home now?